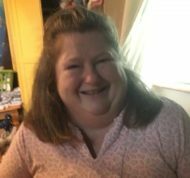 April Love Diehm, 54, of Lancaster passed away on February 1, 2019 at Lancaster General Hospital following a brief illness. Born in Corona, CA, she was the daughter of Mary L. (Diehm) James and the late Mark A. James and the long-time companion of Richard Kieffer. A resident of Lancashire Hall, she was loved by fellow residents and staff members alike. She loved life and loved to meet people. April was a talented baker and an excellent cook. She was also skilled at cross-stitch. She made the most of her life by spending time with her family, who she loved dearly. Together they would travel to Tennessee and Ocean City, MD and do fun activities like horseback riding. April was especially close to her grand-daughter Stacey, who always brought a smile to her face. She leaves behind her beloved companion of over 28 years, Richard Kieffer, her children; Kristi Diehm, Trisha Kieffer, Allen Kieffer, Trevor Kieffer, and Johnny Kieffer, and her grand-daughter Stacey Kieffer. She is also survived by her mother, Mary James, and siblings; Roger Shaub, Donald Riley, Robert Riley, Annita Riley, and Christopher James. A casual gathering will be held, Thursday, February 7, 2019 from 10:00am-11:00am at Charles F. Snyder Jr. Funeral Home & Crematory located at 3110 Lititz Pike, Lititz, PA 17543. Interment will be private and at the convenience of the family. it is still a shock knowing April is gone. Rick and April’s children please know that I will be praying for you.